SpatialKey requires data to be uploaded and imported by way of a CSV file before a dataset can be imported. We have tried to make the import process as fun and simple as possible, but SpatialKey cannot help you get your data into CSV format. In many cases that precious data you need access to will be locked away inside of a database. There are many types of databases, and most of them have capabilities to help get your data exported into a CSV format but they are usually specific to the database in question. This goal of this article is to examine how to get data into a CSV format from many of the more poplar databases and database management systems on the market today. If you do not have access to the database where your data resides and have a database administrator or IT staff that generates your reports for you, pass on the link to this article when requesting data for SpatialKey as it may save them some time as well. Please note that this article deals with usage of the Structured Query Language (SQL) commands needed to run against a database and is intended for users who are familiar with SQL and tools for the database they commonly use. Microsoft Access is a popular file based database used typically by small organizations with limited numbers of users and by individuals as well. MS Access data can be accessed using the MS Access application in a visual way as well as through traditional SQL based approaches. 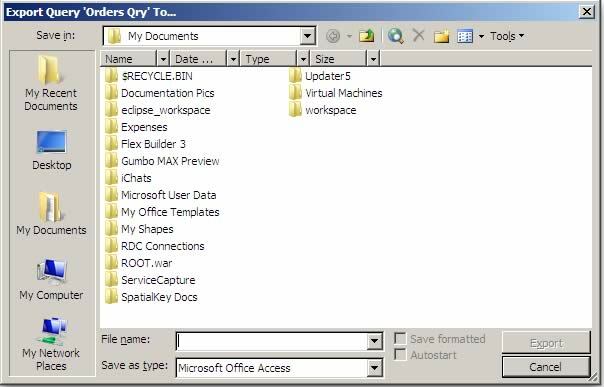 As MS Access has recently undergone a major user interface change, we will explore both the 2007 and 2003 versions of the application (if you are working with an older version, similar techniques should also be available). In the first figure (1.1) you can see I have opened up the standard example database that comes with MS Access (called Northwind). I have also selected the query called “Top Ten Orders by Sales Amount”. To this query, I have added customer address information since SpatialKey loves data that contains temporal (time and date) and geospatial (data that can be translated to a location) data. The final screen of the wizard gives you the option to save the steps allowing for easy re-exporting of the data in the future. If you anticipate needing to update the data in SpatialKey go ahead and check the checkbox to save some time in the future. Close the window when finished. Now you are ready to upload the new CSV File to SpatialKey. 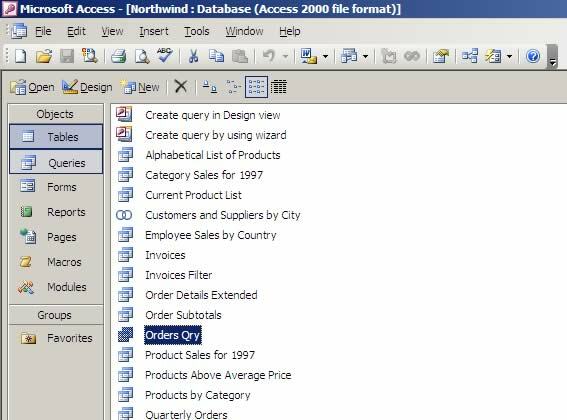 The next figure shows the older MS Access 2003 version of the Northwind database. I will be exporting the saved query called “Orders Qry” on the left. | sed ’s/\t/”,”/g;s/^/”/;s/$/”/;s/\n//g’ : sed is a Unix stream processor, essentially allow for transformations in this case. Here we have four sed commands that change the tabs to double quotes, adds double quotes to the beginning and end of each line and adds a new line marker at the end of each line. The MySQL select statement is using an INTO OUTFILE command to output the results of the SQL select into a file (in this case /tmp/result.csv). This command is extremely fast and produces a properly formatted CSV file including the headers. SQL Server is a commercially available database from Microsoft (there is a smaller, less featured version called SQL Server Express as well that is available for download for free). SQL Server is an enterprise ready database used by many companies around the world. Over the years there have been many management tools both from third parties and from Microsoft (Enterprise Manager, Management Studio, and through MS Developer Studio, for example). Two options for exporting as CSV from a MS SQL Server are use of the BPC (Bulk Copy Program) command line tool or through Data Transformation Services. Bulk Copy Program can be executed from a command line or through SQL. Note that I changed the -U and – P to a -T which uses a trusted connection as we are probably authenticating to the SQL server machine already to run the SQL command. DTS packages can be created using SQL scripts or through a MS user interface. Oracle is a commercially available database that has a large following in large companies. Like SQL Server, Oracle is an enterprise ready database. Options for extracting to CSV using Oracle include using Oracle SQL Developer (a free tool from Oracle) and directly using PL/SQL (generally by creating a stored procedure as it is a bit more code based than the other database solutions). This is by far the easiest way for someone not familiar with complex PL/SQL stored procedures to export data. Right-click the table name in the object tree view. Enter a file name and location. The best way to export data via PL/SQL is to create a stored procedure that uses the UTL_FILE command. For a great example stored procedure for this, please see this article at oracle.com. Note that there is a recommended change to the original stored procedure located in the comments (properly handles the quoting of data with reserved CSV characters). For our enterprise customers that have large amounts of data to import or need frequently updated data into SpatialKey, we offer an additional product called the Enterprise Data Publisher. This is a service based product that runs behind the scenes (and your firewall) that can be scheduled to push data automatically out to SpatialKey from your databases. If you are interested in finding out more about the capabilities and cost of the Enterprise Data Publisher please send us an email by going to our Contact Us page. We would be glad to help you with your data needs! In conclusion, SpatialKey needs your data to shine! Producing data from an existing database does not have to be a daunting task as the steps listed above show, and is an important first step to truly Unlocking your Data!